Jared Kushner, a senior advisor to President Donald Trump and the President’s son-in-law, boasts a thin resume in diplomacy. Trump has assured that Kushner “knows the region, knows the people, knows the players” and will be a critical broker in resolving conflict in the region. Kushner’s family boasts personal ties to Israeli Prime Minister Benjamin Netanyahu, but Kushner himself has not previously involved himself in Israeli politics. The Israeli government appeared open to relying on Kushner as a chief U.S. envoy. “We would be so happy if someone could bring peace to the Middle East. We welcome him,” Deputy Foreign Minister Tzipi Hotovely said at the time. Less of a diplomatic mission than a military one, Kushner appears to have assumed the task of helping pave the way for a peaceful, united post-Islamic State Iraq. 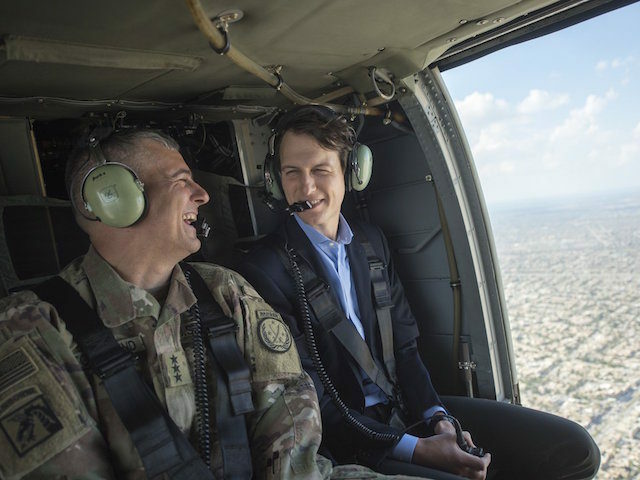 Kushner traveled to the war-torn country this week, alongside chairman of the Joint Chiefs of Staff Gen. Joseph Dunford, to meet with Iraqi leaders and visit a key outpost near Mosul, the largest Islamic State stronghold in the country. Last week, President Trump appointed Kushner to be the head of the White House Office of American Innovation, a new government agency tasked with… innovation. Among the problems Kushner will be responsible for solving innovatively will be the growing rate of addiction to heroin, morphine, and other opioid drugs in the United States. As part of his work in the office, Kushner had reportedly been working behind the scenes for weeks with New Jersey Governor Chris Christie before the latter was announced as the new frontman of an anti-drug initiative in late March. While Kushner has remained largely silent in public on the topic, Christie has vowed to dedicate effort to the initiative. As with a number of other major international visits, Kushner sat in on an Oval Office meeting earlier this year with Vice President Mike Pence, chief of staff Reince Priebus, and Saudi Deputy Crown Prince and Defense Minister Mohammed bin Salman. According to a Buzzfeed report citing leaders attending the meeting this week, Kushner also led a conversation with Muslim-American leaders shortly after the election. There is little more information on whether the meeting was the first in a series or what the objectives of that meeting were. As Kushner’s star has risen following Trump’s election, however, the President appears to be trusting Kushner more and more in precisely these settings: roundtables with prominent individuals focused on how to solve problems. And in this case – between advocacy by Muslim interest groups against Trump and media disinformation on Trump initiatives to keep the country safe – a gentle hand may be the key to fostering cooperation. While Kushner’s foreign policy responsibilities appear largely tethered to the Middle East, he emerged an unlikely diplomatic tool for the President to use in his relationship with Mexico. In January, the Chicago Tribune cited an administration official as confirming that Kushner had played a pivotal role in resolving a short-lived disagreement between Trump and Mexican president Enrique Peña Nieto. By March, when Mexican Foreign Secretary Luis Videgaray arrived in Washington, Videgaray met with Kushner before visiting the State Department, as is typically done. The Washington Post reported that Kushner involved Videgaray in the drafting of remarks by President Trump regarding the wall Trump promised to build on the U.S.-Mexico border and that the chief diplomat helped Kushner and Trump edit a speech that was well-received by Mexican authorities and reportedly garnered Kushner praise behind the scenes.